With the accreditations Supablast hold, we are able to apply all protective coatings in a wide range of industries, and we’ve been doing that for more than 20 years. All our paint applicators hold the ICATs certification which is held in high regard in most industries and required to work in many. We also work to MCDHW and RT/CE/S/039, RT/CE/C/002 and Appendix 19/1 standards. Industrial and commercial paint is very different to house paint, and it needs to be as it's job is a lot tougher. There is more to think about than the type of coating and structure, all our operatives understand the importance of the climate and the paint thickness. Our operatives are trained to read the WFT (wet film thickness) at set intervals to ensure the DFT (dried film thickness) of the coating will be correct. The weather holds it’s own set of problems, too hot and the coating may dry before it reaches the substrate leading to a porous coating, too low and ice crystals can form underneath the coating shortening the coatings life span. With their training and experience our operatives have the skill for any job. Following the completion of our works, we supply a quality file to demonstrate our quality control. Information includes wet/dry film thickness readings, temperature control and name of applicator. We have the coating solution for all types of substrate including masonry, steel, concrete or timber; new structures or maintenance. At Supablast we also deal in all types of tank refurbishment not only in general industry but within the water, oil and chemicals industries too. Whatever the condition of your structure we have extensive knowledge and skills in all methods of preparation and application of protective coatings including Powder Coating, Passive Fire Protection, Industrial Painting applications and Strip Coating. Stripe coating is where additional layers of paint at added to at risk areas, such as corner edges and welds. Supablast can now offer Glass Flake System spraying. By mixing flaked glass in resin we can achieve a high resistant coating that can stand temperatures ranging from +170c to -40c. The glass in the resin creates maze like structures in the coating that is 15-20 times more impermeable than resin only. This enables the coating to move with the substrate during increases and decreases in the temperature and it gives the coating a superior abrasion resistance. Glass Flake can by applied to metals, concretes and FRP (fibre reinforced plastic). It is used in the marine, chemical and petroleum industry's and is ideal for off-shore structures or anywhere that has a ‘splash zone’. Withstands a wide range in temperatures. 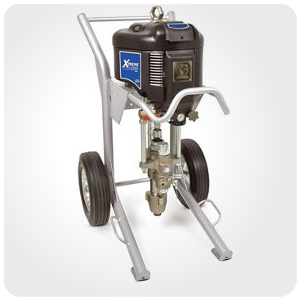 Often used in the marine, chemical and petroleum industries. 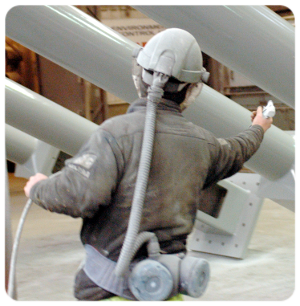 Airless spraying forces the coating through a special spray gun at forces of 500-5000psi. The coating will appear as a narrow sheet which the air disrupts into droplets. There are many different tips for the gun depending on the viscosity of the coating, they can also be used to adjust the flow rate and pressure. Due to the high rate of fluid delivery it is quick, and it also produces less over spray and bounce. It is also more skilled, Supablast operatives are fully training in this method of spraying. Requires a more skilled operator. There are two different approval schemes for coatings: WRAS (Water Regulations Advisory Scheme) and Regulation 31 of the Water Supply Regulations (run by the Drinking Water Inspectorate). Both schemes are concerned with: subjective tests for odour and flavour; specific tests for leaching metals into the water and microbial growth. The requirements for these tests are laid down in BS6920 (or equivalent standards including AS4020 and SS375). While WRAS is applicable to coatings in storage tanks and reservoirs the DWI requirements are more stringent as they apply to coatings in direct contact with drinking water. The main additional concern being organic compounds leaching from the coatings and contaminating drinking water. This additional threat is not adequately covered by BS6920 or its equivalents. Supablast can apply coatings that meet both requirements. The coatings of this type applied by Supablast use a pural component spray machine and have a typical thickness of 1.5mm. All coatings are solvent free. 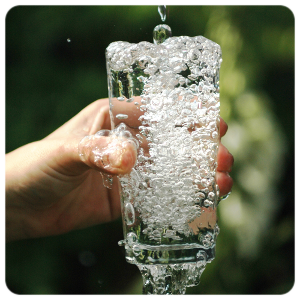 A full copy of the Water Supply Regulations can be downloaded directly from the HMSO website. More details on BS6920 can be found here. 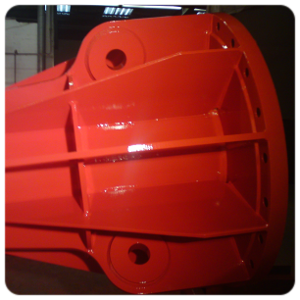 We have our own fully equipped workshop based in Coleshill, West Midlands for Blast cleaning and Powder Coating a wide range of metal and timber items. 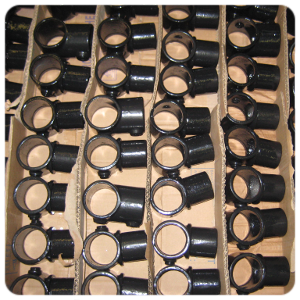 Powder coating is a dry coating. It is applied as a free flowing dry powder and is mostly used for coating metals. It is highly likely that your washing machine and fridge will have been covered with a powder coating. The powder coating is normally applied by electrostatic and is then heated to allow the powder to 'melt' and form a hard covering that is much tougher than standard paint and leaving a smoother finish, especially on vertical surfaces. On a greener note powder coatings have a very low, some say zero, volatile organic compounds, this means the powders chemical compounds don't vaporize and enter the atmosphere. Also powder coating over spray can be recycled and used again so waste is minimal. You can even have an orange peel effect to the surface texture if you wish to hide metal defects. Produces a thick and even coating. Resistant to many organic solvents like thinners and acetone. 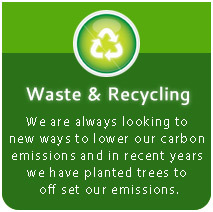 Environmentally friendly as it does not use solvents. Often cheaper than traditional wet spraying. Requires curing in an oven making it unsuitable for structures and very large items. Difficult to produce a thin film. Tends to have a slightly "orange peel" finish (increasing as DFT decreases). Passive Fire Prevention (PFP) products are used to contain, or slow, the spread of a fire, they minimise the risk of damage from fire and smoke passing from one area of a building to another. 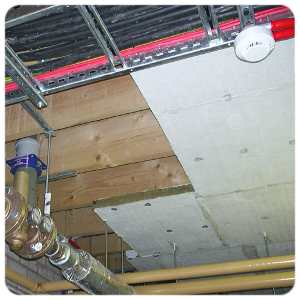 There are a range of dedicated products and materials used depending on the type of firewall, floor or ceiling void that needs to be 'blocked'. Many of these products fall under the heading of intumescent coatings. These work by expanding when heated to occupy many times their original volume. This fills joints and voids, reflecting heat and protecting the underlying structure. The period of protection can extend up to 240 minutes depending on the product used. Not only can this coating be used internally and externally but it is also weather tolerant and comes in a range of top coat colours. Passive Fire Protection is used in off-shore constructions, ships and aircraft as well as in buildings. Up to 240 minutes protection. Unsuitable for complex shapes, curves etc. Most efficient at 90 minute protection and below. Manual of contract documentation for highways work, and this incorporates the requirements of EU legislation which is mandatory for all public procurement bodies. Network Rail standards for the specification to be followed for the assessment of structures. The durability of the coating specific to each job being undertaken.